The Heart of Virginia Association of Rocketry has received an FAA waiver to allow the launch of Class 2 High Power Rockets to an altitude of 6000 ft AGL. The HPR launch site is at the western end of our western field. Consequently, HPR operations will be conducted only when the wind is westerly (NW, W, SW) or calm enough that the rockets may be safely recovered. Otherwise, Class 1 rockets may be launched from anywhere on the field. The launch site is more than 5 nautical miles from the nearest airport. It sits underneath the Farmville MOA, a Military Operations Area from 300 to 5000 ft AGL, which is active 0800 to 1700 Mon-Fri. Proposed rocket launches will occur only on Saturdays and Sundays and will consequently not interfere with military exercises. An excerpt from the Cincinatti Sectional Map near Burkeville, VA appears below. 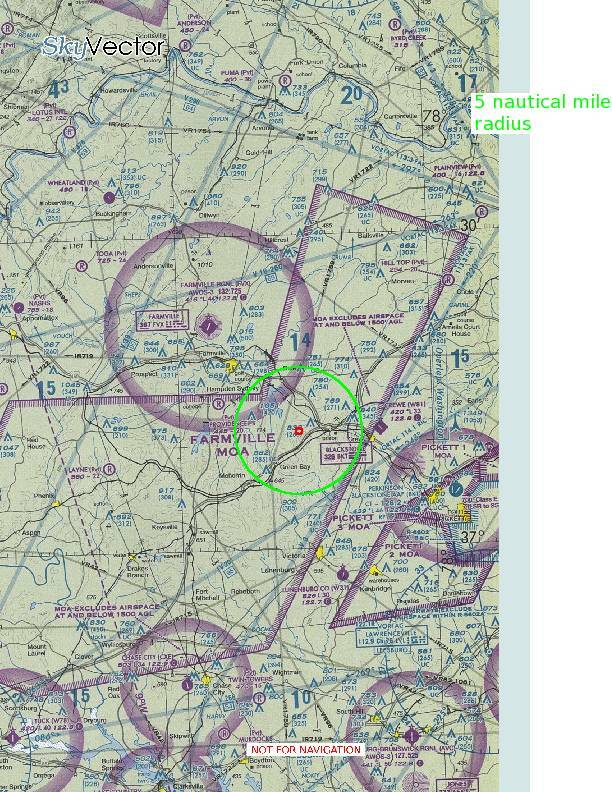 The green circle has a radius of 5 nautical miles from the launch site. 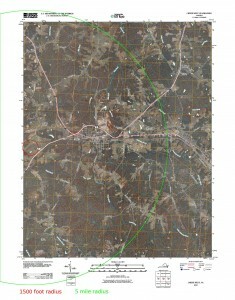 The USGS 7.5 series topo map shows the launch location in more detail. The Burkeville Volunteer Fire Department is less than 3 miles from the launch site. The Crewe Fire Department is less than 6 miles from the launch site. 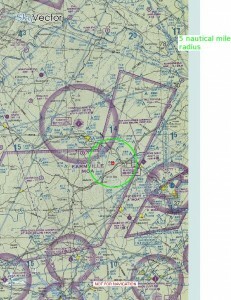 The green circle has a radius of 5 miles from the launch site. The red circle has a radius of 1500 feet. 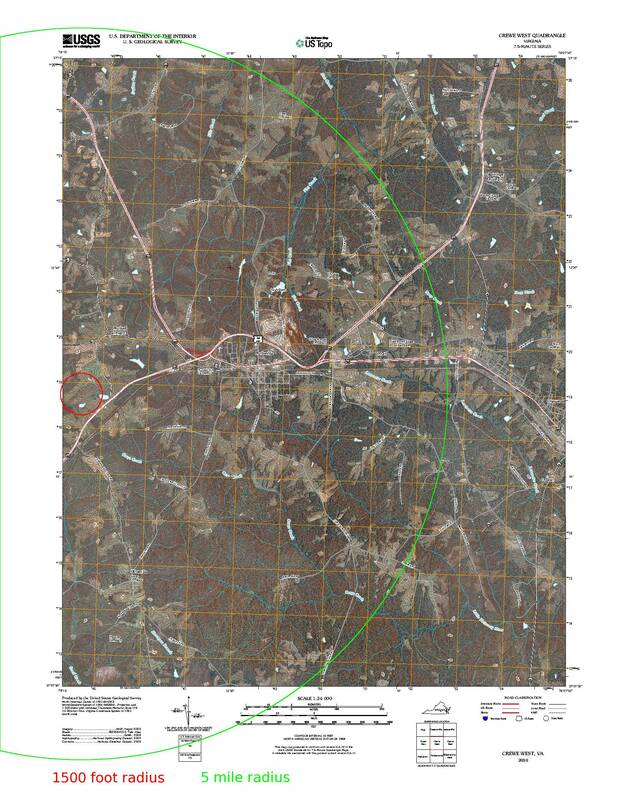 A satellite map shows that the launch site is more than 1500 feet from the nearest house and highway. Spectators and Launch Control Operations will be located 100 feet from the launch pad. A fire extinguisher will be located at the LCO table. 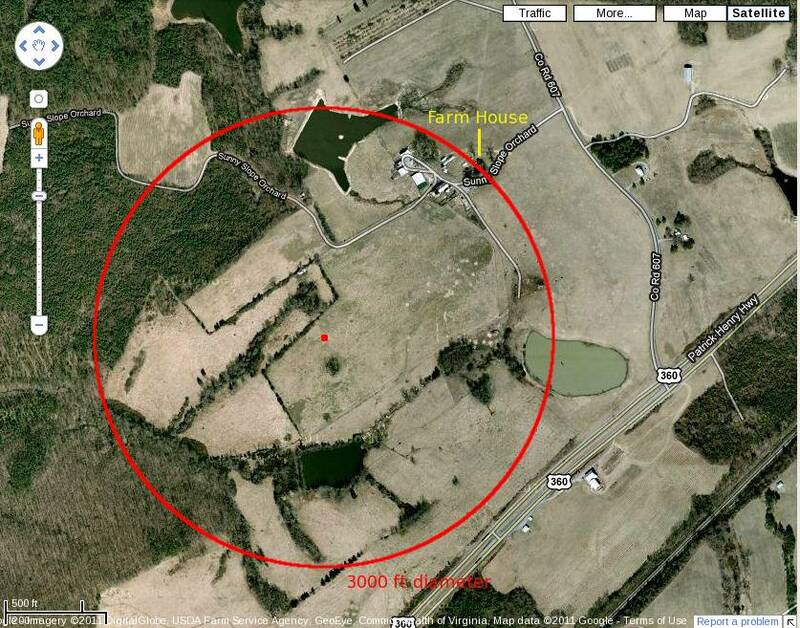 The red circle has a radius of 1500 feet from the proposed launch site.